When you marry into the Austrian royal family, you might expect some benefits from the situation – say, perhaps, that Austria will not attack you. But no such luck, as Napoleon discovered in 1813, when Francis I of Austria joined the leaders of Great Britain, Russia, Prussia and Sweden in their coalition against France. But then Napoleon had a history of fighting Austria, and had already divested his father-in-law of a good portion of his kingdom. Francis I of Austria started out as Emperor Francis II (Franz II), the head of the Habsburg monarchy and ruler of the Holy Roman Empire. He led Austria into the French Revolutionary Wars, and later joined the Second and Third Coalitions against Napoleon. Napoleon defeated the Third Coalition at the Battle of Austerlitz in 1805. He then reorganized a chunk of Francis’s territory into the French-controlled Confederation of the Rhine. With little left of the Holy Roman Empire, Francis dissolved it and was reduced to being Emperor Francis I of Austria. As such, he continued to oppose Napoleonic France, losing more battles and more territory. I wish only what it is my duty to wish…. Ask my father to consult his duty as a ruler, and to subordinate to that any interests connected with my person. Having never met each other, Napoleon and Marie Louise were married by proxy in Vienna on March 11, 1810. This was followed by civil and religious ceremonies in Paris on April 1 and 2. For details about the weddings, see my article on the marriage of Napoleon and Marie Louise. Things were cozy for a few years. Marie Louise produced a son, Napoleon François, born on March 20, 1811. Napoleon doted on the boy and Francis grew very fond of his grandson. But strategic interests reigned supreme. In 1813, Austria joined Britain, Russia and Prussia and other members of the Sixth Coalition in the war against Napoleon. When Napoleon was exiled to Elba in 1814, Marie Louise hoped that she and her son could join him. Francis refused, citing his need to accede to the wishes of the Allied sovereigns. Meanwhile Napoleon had sent Marie Louise to Vienna, hoping she could prevail upon her father to secure leniency for him. Instead Francis placed her in the care of Count von Neipperg. Neipperg seduced Marie Louise (see my article about that here). When Napoleon escaped from Elba, Marie Louise wrote to the Congress of Vienna protesting that she was in no way complicit with her husband. She placed herself under the protection of France’s enemies. In recognition of the role Austria played in Napoleon’s defeat, Francis, represented by Metternich, presided over the Congress of Vienna. This meeting of European leaders was convened to restore traditional rulers to the lands Napoleon had conquered. It aimed at achieving long-term peace through the creation of a balance of power in Europe. With the rulers of Russia and Prussia, Francis I of Austria established the Holy Alliance. The ostensible aim was to instill Christian values in European political life. In practice the Alliance opposed democratic, revolutionary and secularist tendencies across the continent. Francis was born on February 12, 1768, in Florence, the eldest son of Leopold, Grand Duke of Tuscany and future Holy Roman Emperor, and Archduchess Maria Louisa of Spain. He had 15 siblings. Marie Antoinette was his father’s younger sister. This made Francis a cousin of the Duchess of Angoulême. In 1784, Francis joined his uncle, Emperor Joseph II, in Vienna. With no surviving children, Joseph knew that Francis would eventually inherit the imperial throne. He took charge of Francis’s development, providing him with a strict routine and a disciplined education. Francis worked diligently and studied hard. Sent to join an army regiment in Hungary, he enjoyed the military routine and became a seasoned soldier. Francis’s will also insisted that Ferdinand, once he became emperor, had to consult Archduke Louis – Francis’s brother and Ferdinand’s uncle – on every aspect of internal policy. On foreign policy, he had to consult Metternich. Probably because of his parents’ genetic closeness – double first cousins – Ferdinand suffered from a variety of debilitating conditions, including hydrocephalus and epilepsy. The Mad Monarchist has done a touching post on him. Francis inherited the imperial throne on March 1, 1792, at the age of 24. As a monarch, Francis was an unwavering absolutist. He believed his authority was granted by God. He opposed the ideology behind the French Revolution. He feared calls for liberty and equality, and strongly opposed the influence of revolutionary thought in Austria. European liberals deemed him a tyrant. To govern his vast, multi-ethnic lands, Francis relied on extreme centralization and the most extensive bureaucracy in Europe. One of Metternich’s colleagues said “administration has taken the place of government.” (7) The press was heavily censored. Secret police were rife. Foreigners, intellectuals and even members of Francis’s own family were spied upon. Cultural life was overshadowed by political control. Francis was by nature suspicious and did not delegate much. He conducted policy on the basis of his own decisions, consulting with whomever he thought necessary. He believed that all his subjects needed was material well-being and good laws. Francis was unimaginative, unpretentious and commonsensical, with a sardonic sense of humour. He had simple tastes and preferred a quiet life. He rode in an old-fashioned green calèche. He dressed in a shabby brown coat and hat. He had a conservatory full of plants, where he liked to garden. He was fond of making sealing wax and cooking toffee on the royal stove. He greeted his subjects affably in a broad Viennese dialect. Though Metternich smoothed his utterances in print, Francis suffered from verbal tics, of which I have tried to capture a slight sense in Napoleon in America. Francis I of Austria died on March 2, 1835 of a sudden fever. He was 67 years old. His tomb is in the Imperial Crypt in Vienna. Correspondance de Marie Louise, 1799-1847 (Vienna, 1887), p. 141. Dorothy Julia Baynes (Dormer Creston), In Search of Two Characters: Some Intimate Aspects of Napoleon and His Son (London, 1945), p. 151. Richard Metternich, ed., Memoirs of Prince Metternich, 1773-1815, Vol. 1 (New York, 1881), pp. 73-74. Alan Palmer, Metternich (London, 1972), p. 86.
http://en.wikipedia.org/wiki/Caroline_Augusta_of_Bavaria Accessed Oct. 31, 2014. Andrew Wheatcroft, The Habsburgs: Embodying Empire (London, 1996), p. 254. A.J.P. Taylor, The Habsburg Monarchy 1809-1918 (London, 1990), p. 44. Edith E. Cuthell, An Imperial Victim: Marie Louise, Vol. II (London, 1912), p. 15. Memoirs of Prince Metternich, p. 127. Austria led the Grand Alliance at the Congress of Vienna. It is interesting to follow it through WW I, WW II, BENELUX, EUROPEAN, UNION and OPEC. Yesterday’s oil production cut back by OPEC was a stroke of genius. 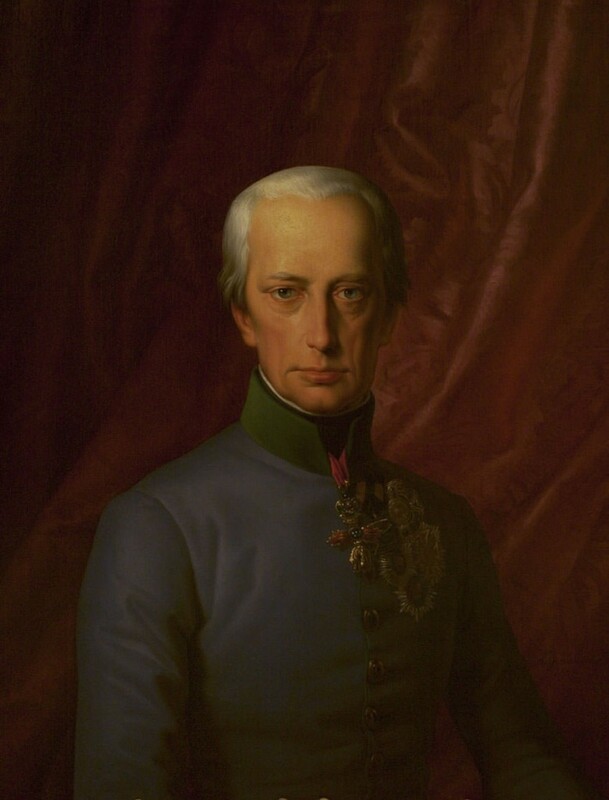 I’m very interested in learning more about my ancestor Joseph von Werklein and his military history with Francis I and later his daughter Marie Louise Duchess of Parma, where he served as her Prime Minister during the Carbonari uprising. It’s lovely to hear from you, Marta, and very interesting that Joseph von Werklein was your ancestor. I found a few references to him and his wife in Marie Louise’s correspondence (see: https://books.google.ca/books?id=7zkTAAAAQAAJ&pg=PA280&dq=Werklein&hl=en&sa=X&ved=0ahUKEwik15a0w9PLAhWJLmMKHePZA0Q4ChDoAQhFMAY#v=onepage&q=Werklein&f=false). He is also mentioned several times in An Imperial Victim: Marie Louise (Vol. II) by Edith Cuthell, available for free on the Internet Archive: https://archive.org/details/imperialvictimma02cuthuoft. [A] child governed by his ministers, a weak and false prince, and a good and religious man, but a blockhead occupied only with botany and gardening.